Film writer and director Mike Leigh has criticised Thom Yorke and Radiohead for ignoring Palestinian suffering, two days ahead of their controversial Israel gig. Last week Radiohead front-man Yorke defended the band’s decision to play in Israel and ignore the Palestinian picket-line, arguing that music was about ‘crossing borders’ and ‘shared humanity’. Artists for Palestine UK published an Open Letter to Radiohead signed by 47 leading cultural figures back in April. Today, we issue the following statement in response to frontman Thom Yorke’s comments via Twitter directed at Ken Loach (copied below). 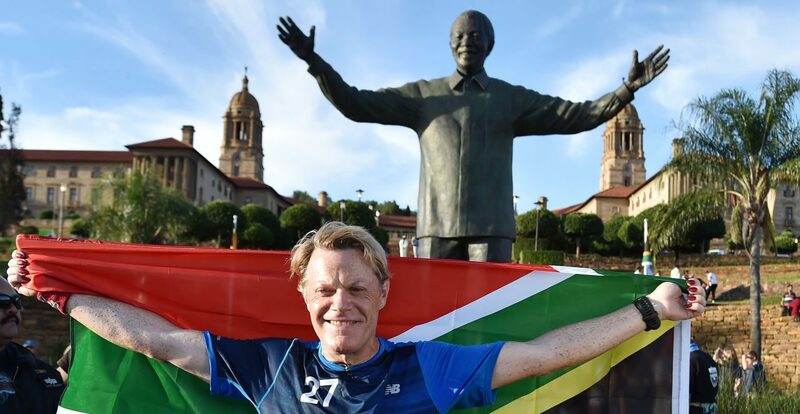 ‘In a development saturated with political and emotional charge, South African runner Mervin Steenkamp came in first, for the second year in a row. Second-placed Thaer Shanaah is from Gaza, the densely populated coastal strip under blockade by Israel’. Artists for Palestine UK (APUK), whose Artists’ Pledge for Palestine has over 1200 signatories, called today for UK band Radiohead to cancel their concert in Tel Aviv, scheduled for July 19. On Monday The Guardian put out a press association report on high-profile sculptor Anish Kapoor’s acceptance of Israel’s $1 million Genesis prize. The prize is awarded by the Genesis Prize Foundation, the office of the Israeli prime minister and the Jewish Agency for Israel and “recognises individuals who have attained excellence and international renown in their fields and whose actions and achievements express a commitment to Jewish values, the Jewish community and the State of Israel”. Artists have written to DJ Fatboy Slim asking him to cancel his forthcoming show in Tel Aviv. Norman Cook, AKA Fatboy Slim, said recently in an interview that his criteria for accepting a gig means it has to ‘fulfil the 5 f’s’ – a first, a favour for a friend, fun, finance, food. Playing the settler-colonial state may be ‘a first’ for Fatboy, but it’s only going to be ‘fun’ if he ignores the experience of Palestinians including those within Israel’s borders. We hope he thinks again. In an interview with Israeli media Chemical Brothers deny they are asked to boycott Israel despite over 7,000 people asking them to do just that. They are quoted as saying ‘pressure was not applied to us. We will go to any place where young people want to see us playing. We are not really involved in all the rest’. Needless to say, if the controversial concert goes ahead, fans in the occupied Palestinian territories will not be able to reach it due to ‘all the rest’. (October 29, 2016). Senegalese singer Baaba Maal, due to perform in the Israeli-occupied Old City of Jerusalem on Tuesday 20 September, is a Global Ambassador for Oxfam. Artists for Palestine UK has engaged in discussion with Oxfam in the hope the organisation would dissuade him from going ahead with the performance. We have argued that an NGO which recruits artists to promote its values needs to make sure the artists’ actions are consistent with those values. Baaba Maal appearing in occupied East Jerusalem is not, we’ve argued, consistent with Oxfam’s stated opposition to Israeli colonisation policy. We are making public an edited version of our most recent letter to our Oxfam interlocutors. Every document of civilisation, wrote Walter Benjamin, is also a document of barbarism. He could have had the corporate-sponsored London art scene in mind – and in particular the Zabludowicz Collection, now a strong presence in London, as it is in New York and Helsinki. With the growing influence of Zabludowicz, art and the occupation of Palestine are becoming more closely linked – a linkage which artists are now challenging.